Considering we’d only gone in on Tuesday and this was Thursday, this was not good news. Generally it takes 7-10 days to get biopsy results back, which means Shiloh’s had been fast-tracked. We’ve gone to the same vet for years, and they know how much we love our dogs. So as soon as I heard the kind vet tech’s voice on the other end of the line, I knew something was very wrong. I’d called Monday morning because sweet Shiloh, our rescue hound, had something going on with his mouth. The sides of his face seemed tender, but because he’s had boundary issues since we adopted him a little over three years ago, I wasn’t able to open his mouth wide enough to figure out what was going on. They gave me an appointment on Tuesday afternoon. Shiloh was rescued from a hoarding situation. He entered our lives at the age of somewhere-between-7-to-9 (depending on which records you believe), having spent much of his life chained to a doghouse in the mountains of West Virginia. There was no fence around his tiny abode, so in addition to facing the elements he was unable to run from threats. I can’t – don’t want to – imagine what he endured, but I am forever grateful to the rescue group who saved him and fostered him until we were able to find and adopt him. When he first joined our family, he didn’t know his name, or the word “toy”, or the word “treat”. He peed on the indoor floor plants one by one, equating greenery with outside. He loathed linoleum, and when forced to walk on it looked like he was channelling Agador Spartacus wearing shoes in Birdcage. He methodically destroyed all of our floor-length blinds in a committed bid to see outside. He counter-surfed, destroyed plush toys by the dozens and ate anything he could find, including half a pound of coffee beans. He feared thunder and lightning and heavy rain. It took him a week to lay down in the house, and months to stay prone in a room when anyone walked in. 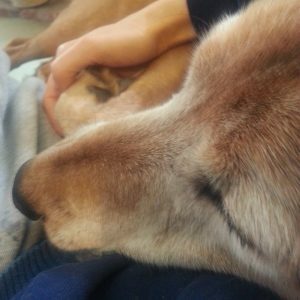 He’s never trusted men, and this includes my husband, who has been nothing but kind, gentle and infinitely patient throughout Shiloh’s years with us. There’s an uneasy peace between them, but Shiloh is ever-wary. Of course, all bets are off in the kitchen, which – in Shiloh’s mind – is The Single Happiest Place on Earth. They bond over treats, and treat time is one of the few times my husband can sneak in a pat or two before Shiloh scoots backwards into the hallway. And yet as I type this, Shiloh is snoring peacefully in the doorway to my office. 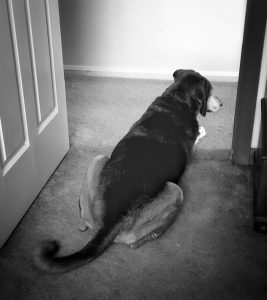 Since day one he has designated himself my furry sentinel, following me through the house like a shadow and always – ALWAYS – positioning himself between me and any door. No matter which room I’m in – office, living room, closet – he sits, facing outward, back to me, guarding me from dangers only he can see. Which makes it that much worse that I can’t guard him from this. I wasn’t sure what to tell the vet tech on Tuesday, so I stuck with the basics: Shiloh’s face seemed tender and I wasn’t able to check inside his mouth to see if things looked okay. He’s always had bad teeth, having chewed the bottom ones to nubs trying to escape his chain in his previous life, and I hoped that this was simply a teeth thing. Only we’d just had him in a couple of months ago for a dental cleaning. They took him back to examine him, and soon our vet was pulling me into a room and saying he’d discovered lesions bleeding in the back of Shiloh’s throat, one on each side. They did an emergency procedure to figure out what was happening, sent the lesions for biopsy and returned him to us that night. Shiloh is resilient. He was interested in food as soon as he got home. You’d never have known he had stitches in the back of his throat. You’d never have known he has cancer. The second day of soft food did not go well for Shiloh, his nose, his feeding station, the floor, the walls or the small glass table he sneezed on following breakfast. He is a kibble dog, that hound, to the point that he will nose my hand gently whenever I am filling the dog bowls to remind me to sneak him a few extra pieces, which he munches contentedly as a little warm-up before the big event. We think it’s because of his teeth, which seems completely counterintuitive. Yet he can crunch with his back teeth and has a hard time picking up or nibbling things with his diminished front teeth, so it all makes a weird kind of sense. And it explains why New Kibble Day is an event worth celebrating around these parts. Shiloh has learned exactly two things from his older sister, Sophie The Wonder Dog. One is barking incessantly during playtime. The second, and more notable, is using his keen nose to discover and unmask pills from almost anything – pill pockets, Velveeta, peanut butter, braunschweiger, wet food. This is how I came to develop mad skillz in origami deli ham folding. When it comes to ham, Shiloh knows the pills are there, but he’s content to inhale first and ask questions later. Later that day I received the message from the vet’s office, and hurried home to return the call. Later that day is when I learned that my sweet pup has cancer. So what do you do when you learn your dog has cancer? First, you sit on the phone with silent tears coursing ceaselessly down your cheeks, jotting down useless words and phrases on a small scrap of paper like that will make some kind of difference: cancer, aggressive, malignant melanomas, prognosis guarded, may not make it to Christmas, not much we can do. You try to keep your voice steady, but you know you’re not fooling anyone. You thank the vet tech whose unhappy job it was to deliver the news for her kindness, knowing that it must be breaking her heart, too. You sit and feel the blood drain from your entire body and flow directly into your heart, which is beating faster and faster and seems to be on fire inside your chest. You get lightheaded. You feel like throwing up. You begin to sob like your heart is breaking, because your heart IS breaking, as you slide slowly to the kitchen floor. And then you are forced to smile when both dogs wander in with the dual purpose of cheering you up and negotiating for treats. You give both dogs treats. You give them treats over and over again because it helps to feel like you are making them happy, that you are able to do this one thing that brings them such joy. You call your husband and hear the pain and sadness in his voice as he tries to console you. You call your mom, who loves her granddogs to pieces, and hear the same pain and sadness in her voice. You won’t explain to them, you can’t be bothered to explain, why this is different, why – because he’s had such a difficult life – THIS dog deserves to not suffer. This dog deserves better. But then you think: all dogs deserve better. People deserve better. But this is life, and life is not always fair. You spend most of the evening petting him and walking away, petting him and walking away, checking on him every few minutes until you realize that you are actually kind of freaking him out. Your focus begins to shift. 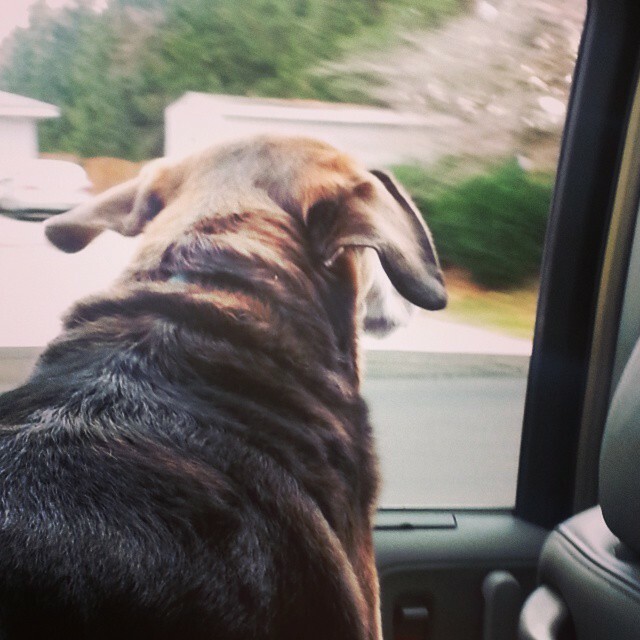 And then you slowly realize something important: Shiloh doesn’t know he has cancer. Shiloh knows he still wakes up each morning with his tail wagging as he races downstairs to grab his favorite squeaky toy to cheer on The Making of Doggie Breakfast. He knows to remind everyone when Doggie Dinnertime gets close. Shiloh knows he enjoys dancing on his back paws to get a sneak peek of what’s in his bowl each day, seconds before it is set down in front of him. Shiloh knows he loves racing into the backyard with his booming “WooOOOoooOO!,” autumn leaves scattering and floating through the air in his wake. 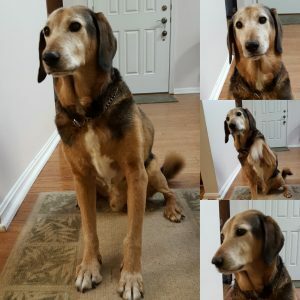 Shiloh knows he enjoys belly rubs, and snuggling on the couch, and settling down into the office doorway, facing the hallway as he slides into a deep, uncomplicated sleep. He understands that life is life. He is living. He is comfortable. He is happy. He is safe. So for now, I will follow my wise dog’s lead. I will see this as an opportunity to fit as much life and love and joy into each day as I can, both for him and for Sophie. And for my family, and for my friends. Because isn’t that what we should be doing anyway? Every single day? I will race downstairs with him each morning, excited to greet the new day. I will play with him, and sing to him. I will snuggle with him as I read. I will stop to pet him each time that I see him. And each night, I will lay in bed and allow myself to drift gently into sleep, comforted by the soft sounds of his breathing. I will do this until we both know that it is time for him to begin his next big adventure, and I will hope that I am brave enough and strong enough to know when that is. I will be sad later. Because now? Now is the time for living. You really captured what it is like getting that call from a vet and it is so true how you have to refocus and make the most of your time together. Reading this made me feel so sentimental! Every dog that I’ve had, we eventually put down. But I’d rather know and plan for it, and make sure we can do it peacefully and lovingly so the dog feels safe the whole time! Our aussie died in 2012 from an aggressive melanoma in her nose and our vet gave us a great suggestion to help us know when it was her time. He said to make a list of all the things she really enjoyed doing – do them as much as we could – and when she couldn’t do more than half of them anymore then we should help her go. I’m sorry you all are going through this. Oh, Mickey….I am devastated for you as you face the days ahead. 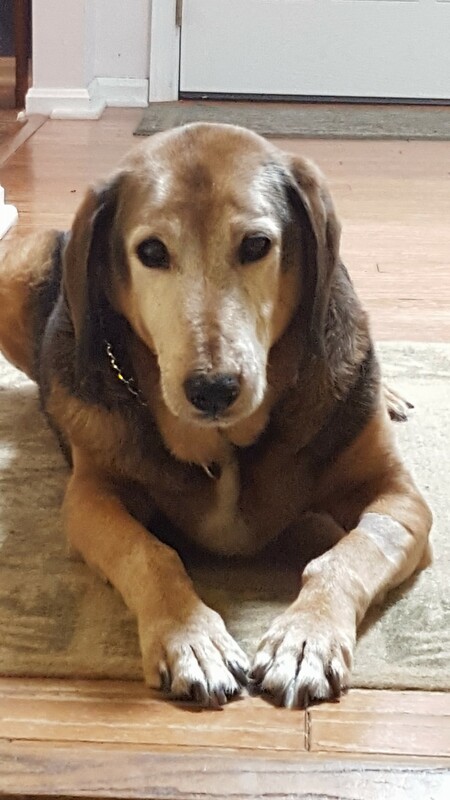 Having gone down this road so many times, and knowing your compassion and love for AllDogs, I send you constant hugs and strength as you make Shiloh’s remaining days the best EVER! Hugs to you and thank you for….as always….sharing such a rich and positive message. Joan, I KNOW you know, and I appreciate your kindness. It is hard to stay positive in the face of news like this, but all we can do is hope we have more time than we think and that we make the most of the time we do have. Many hugs headed back your way. First, I’m really sorry to hear this. I always smile when you share your #AllDogs adventures and pictures on Facebook, so I’m sad to hear of this news. But you’re right. Shiloh has given you much to be happy about, and no doubt will continue to. Live for these moments now, and we’ll be here for you when those moments take pause. Ohhh what a beautiful tribute to such a sweet puppy boy. Of course, I’m crying like everyone else, but as you point out, one of the lessons we learn from dogs is to live in the moment and squeeze as much joy as we can from each moment. I don’t believe dogs have a great sense of time (witness almost the same ecstasy when you come back inside from taking out the garbage as when you return from being gone all day… Hello, it was two minutes!). That is also a gift. I’m sure that the amount of joy and love that you and Shiloh and the rest of the family will share in the coming months will seem like another lifetime of happiness to him. Sending you big hugs!! That is one of my very favorite things about dogs – you leave the house for 2.7 seconds, come back in and THEY ARE DELIGHTED BEYOND ALL REASON TO SEE YOU. Maybe it’s a character flaw, but I need that kind of positive reinforcement in my life. Dogs definitely have a lot to teach us about life and how to live it. Their capacity for love and joy and optimism is remarkable, and they are so incredibly resilient. Here’s to many more adventures with All Dogs, even if it’s simply belly rubs and New Kibble Day and snoozing in the sunshine as I write – no matter how mundane the action, life with them is NEVER dull. Many hugs, my friend. After reading this yesterday, I’ve been thinking about how incredibly lucky Shiloh is to have found you, Mickey. His life was SO hard before, and then a miracle happened. And you are that miracle. I can see that in his face. And in that absolutely magical picture of you hugging him. It’s tragic that your life together is likely going to be shorter than hoped; get EVERY DROP of it that you can. It’s so beautiful. Much love. I’m so sorry about your pup – it is never, ever easy to lose them. Cancer is particularly rough because – as you say – it’s so hard to know what to do. Are they happy? Are they comfortable? How much is too much? 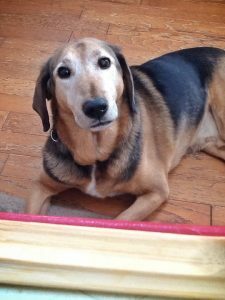 We learned a LOT from our Indy dog, who we sadly also lost to cancer, about the necessity of making decisions for THEM and not for US. And for now, I’m just happy to have more time with sweet Shiloh and Sophie and plan to hug and pet and fuss over them A LOT (which of course is totally fine with them). Thanks so much for stopping by. Shiloh I am comforted that you were able to know & to give both happiness & love. He really is the happiest dog, Jane – he got a brand new squeaky toy last night and spent the morning parading around the house, flinging it with joyful abandon. You’d love him. Mickey, I’m so sorry to hear this news. 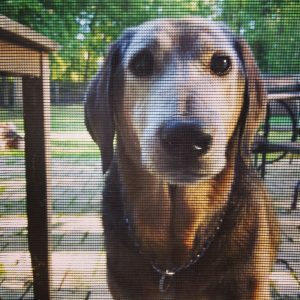 My sweet doggie Coco was diagnosed with a melanoma in his mouth last fall, and I had to put him to sleep in June. It’s a horrible situation, and there’s no way to sugarcoat it. I miss Coco terribly and think of him every day. But I know I gave him the best life I could during the 6-½ years we had together. I can’t know what he suffered before we met, but I know he never suffered after we met, at least not if I could help it. And you will take care of Shiloh and do whatever he needs and he will always know he is loved. And it will be horrible when the time comes, but you will be comforted by knowing that no one else could have taken better care of him than you and Juan. Sending you and Shiloh love and hugs. My heart goes out to you and your sweet dogs. I share the joy of adopting a wonderful friend in need of a good home and after a few years, the pain of learning that dear friend has cancer. You have the best plan – live life with happiness and as much fun as possible. All Dogs are blessed to have you as family. I know you’re extraordinarily fortunate to have them. Oh, Mary, clearly your companion is fortunate to have you, too. We knew going in that adopting an older dog wouldn’t be easy for many reasons, but the hardest part would be knowing that our time together might be shorter than we’d like. So we focus on the fact that we try to give them the best life we can, and we love them with all of our hearts. And they love us back and enrich our lives beyond measure. And I wouldn’t trade that for the world. Oh honey. My heart breaks for you. But you’re right. Shiloh doesn’t know. And you need to follow his lead. Now is the time for living. Much love to you. Oh Mickey, I am so, so sorry for this news. What a beautiful tribute to your sweet baby dog. He is a lucky dog, to have been placed with you, and it’s clear you feel just as lucky. Enjoy him and his love of life. Our thoughts are certainly with you. Juli, thanks so much. I still have many Shiloh stories to share, so I’ll just have to type faster, I guess. And yes, I think we’re all lucky to have found each other. A point I neglected to mention is that JUAN is the one who found him – how funny is that?! I remind Shiloh of this whenever he gets skittish, but it does no good. Hounds, right? Your kind words and thoughts are very much appreciated. Beautifully written and well stated. How lucky All Dogs are to have you and Juan. I know you’ll treasure every precious second with Shiloh. Gotta go now; starting to cry again for sweet Shiloh, you, and Juan. No crying! Well, okay, maybe a little, but really it’s all about treasuring what we have, right? And I’d say that Juan and I are super lucky to have All Dogs – we simply cannot imagine life without them, and as an old tv show so solemnly stated when we were young: You take the good, you take the bad, you take them both (I’ll stop there because now we’ll be singing that all day – you’re welcome). Much love, you. What a beautiful tribute to a loyal and lovable friend! He is our sweet boy, isn’t he? You should have seen this morning’s Parade of Squeaky Toy. It. Was. EPIC. Reason 101 not to read FB just before leaving office – must now make myself look presentable after tearing up like a fountain. You and Shiloh got some living to do. Yeah, upon reflection my timing for posting this could have been a little better for my east coast friends. Thanks so much for taking the time to read and comment – though – it means a lot. Hugs from me AND Shiloh. Big hugs to you and Shiloh! I read this with tears streaming down my face. Let those sweet wags and kisses and snuggles fill your heart. Shiloh clearly had a horrible start to life, but what a wonderful finish he is having. I know you were meant to rescue him and show him love and compassion. He learned love and trust. You have both done your jobs well. Now just love and know when his next big adventure calls, you have at least one supporter who won’t ask you to explain, who will just know, and wish she had adequate words to comfort. Love from England my Dear Friend!!! Thanks, Amy – your words are far beyond adequate and very comforting, and I can’t tell you how much I appreciate them and you. For a long time I was so angry at how his life began and what he had to endure. He taught me – through his actions – to let that go and live in the moment. That’s just one of a zillion things I love about dogs in general and Shiloh specifically – they have such great hearts. 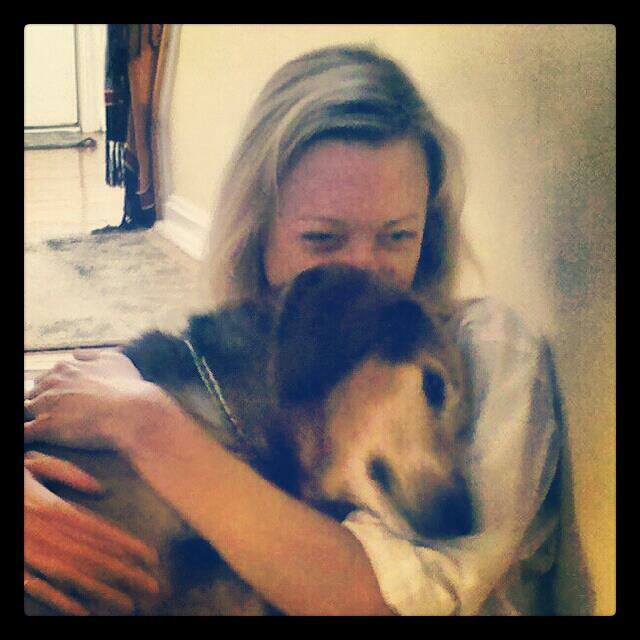 Hugs to you and your sweet pup, dear friend.